New 2017 Yamaha F30LA four stroke outboard motor. Manufacture date 10/17. For Those Who Rely On Their Quality Time. Nothing beats a day on the water with family and friends. And nothing powers those moments quite like Yamaha’s versatile line of midrange outboards. Ranging in size from the mighty F90 down to the nimble F25, they offer just the right amount of power for a variety of applications. These 2-, 3- and 4-cylinder dynamos are quiet, clean-burning, reliable performers. But that’s not all they have to offer. 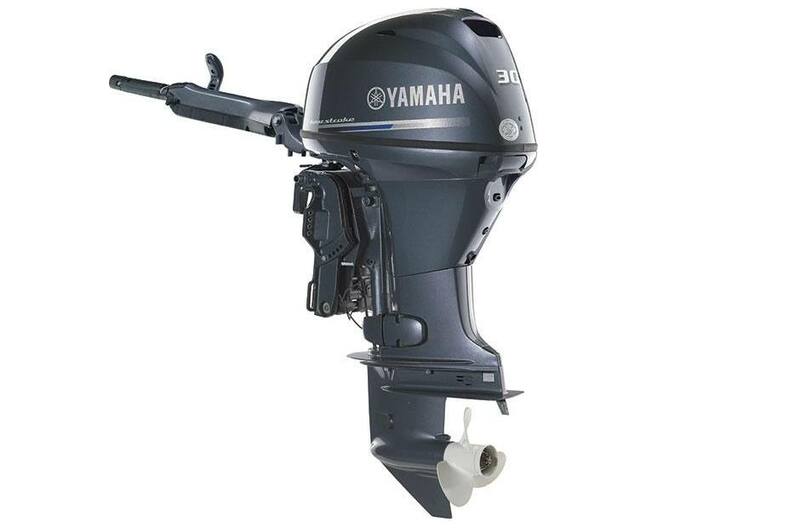 F30: This nimble outboard boasts impressive power and superb, four-stroke performance. At just 214 pounds, it's perfect for lightweight craft such as aluminum fishing boats and inflatables. Fuel Economy: Precision Multi-Point Fuel Injection (except F25) uses individual fuel injectors and a system of on-engine sensors to deliver an optimal fuel/air mixture to each cylinder. F25 models use our PrimeStart™ auto-enrichment system. Both provide easy turnkey starting, smooth acceleration and maximum fuel economy. Powerful Hole Shot: The Composite Intake Manifold, on midranges F90 through F30, features long tube intake tracks, tuned to increase airflow, which boosts low-end and midrange torque. This means a more powerful hole shot and increased acceleration. Even with all this responsive power, an air silencer box and surge tank reduce air intake noise and air turbulence for smooth, quiet operation. Optimum Overall Performance: Microcomputer Ignition, featured in all Yamaha midranges, adjusts timing to maintain optimal engine performance, economy and power under all operating conditions. Smart Design: A Single Overhead Camshaft (SOHC), on the F25 through the F70, provides a compact, lightweight, space-saving design that won an Innovation Award from Motor Boating and Sailing magazine. Precise Valve Timing: Double Overhead Camshaft (DOHC), on the F75 through the F90, features four valves per cylinder. Valves are activated through direct contact with the camshaft, for more precise valve timing control. Rocker arms and their adjustment are eliminated for increased reliability and less maintenance. Ultra-Low Emissions: All of Yamaha’s midranges are California Air Resources Board (C.A.R.B.) Three-Star Rated for Ultra-Low Emissions and meet all federal EPA requirements. Anti-Corrosive Design: A Top-Mounted Flywheel helps to protect sensitive electrical components from harmful corrosion. Warranty Protection: All Yamaha four strokes are protected by our Three-Year Limited Warranty for pleasure use. Beyond that, Yamaha Extended Service (Y.E.S.) plans are available, for continued coverage after your three-year factory warranty expires. Anti-Corrosive Barrier: Our exclusive YDC-30 Alloy is one of the most corrosion-resistant base material in the industry. Used with our proprietary ACP-221 Paint Process, it provides an extra-tough barrier against corrosion. These measures are both key components of our renowned Ultimate Corrosion Protection System, which is standard on all Yamaha midrange four strokes. Smooth Operation: A simple Single Throttle Valve design is lightweight and allows for quick, easy adjustment. The air silencer box on the F75 and F90 reduces intake air noise to a minimum with the use of a highly porous nylon cloth that soaks up the noise making these engines whisper quiet while the surge tank reduces air turbulence for smoother operation. Ergonomic Control: Yamaha’s award-winning, Multi-Function Tiller Handle is available on all F30~F90 midrange models. These handles feature Variable Trolling Speed (VTS™), allowing you to fine-tune your trolling speed in 50-RPM increments with the touch of a button. The F30 and F40 tiller handle also features an LED light that alerts operators to overheating or low oil pressure. Power to Spare: A High Output Alternator keeps your batteries charging even when you’re running multiple electronics for long periods of time. This allows you to focus on the fishing—not the batteries. Trolling Control: Variable Trolling RPM, available on the F30 up to the F90 models, allows you to fine-tune your trolling speed in 50-RPM increments (between 550 and 1000 RPM depending on the model). Then, lock it in with the touch of a button on an optional Command Link® tachometer or optional Multi-Function Tiller Handle. Easy Engine Flushing: A Freshwater Flush Device allows you to flush the engine without running it, for added convenience and long engine life. Effortless Tilt: The F25 electric and manual start tiller models and the F30 LEHA model now feature Nitro Assist Tilt. These gas charged struts, similar to those that lift a car hatchback, make tilting almost effortless. Degree of Tilt: PTT Models: 66 deg. Nitro-Assist: 65 deg.